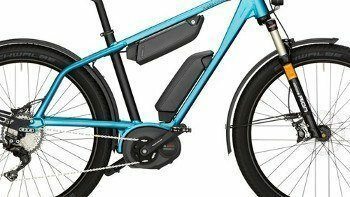 In this post I will explain to you what are the different types of electric bikes available and what types of e-bike motors are available. I will also show you how to choose an electric bike, which electric bike you should buy and help you get familiar with E-bike terminology and how they affect the ride and performance of the bike. E-bikes can come in many different sizes and built for different riders and riding needs. Motor and battery location varies and can significantly affect the feel of an E-bike. 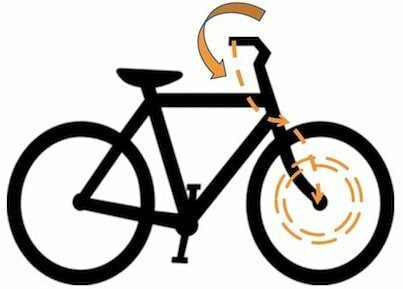 All E-bikes come with electric motors that are located in one of three locations-front, mid or rear and have peddle assist and throttle on demand I will explain the advantages and disadvantages with each location in this post, also peddle assist and throttle on demand. If you are brand new to E-bikes I will first explain a few points to know to help you better understand some of the E-bikes options. An E-Bike is not unlike a regular bike that you are already familiar with. They both have peddles and handlebars. On the handlebar, brakes are in the same place as on a regular bike, but on an E-bike it has an additional few items, the main one being a throttle. With a squeeze or twist of your wrist on the throttle, the bike will propel you forward. This magic happens from the Electric Hub Motor that is mounted in one of three places, back, mid, or front and is powered by a rechargeable battery. There are few ways an E-Bike can be powered. Pedal assist and power on demand. Pedal assist provides a little extra boost to your pedaling. Works automatically when you start pedaling. No throttle and straightforward operation. Pedal assisted is an excellent option compared to a throttle controlled E-bike. The pedal assist is more intuitive to the rider than throttle controls. It makes pedaling easier and gives you a feeling like the wind is at your back. Pedal assist gives you a little more power at startup and when you go up hills. Great for older people or people that need a little extra help to get around but still want some of the benefits of cycling. Power on demand operates with a twist throttle just like a motorbike. As with power assist the power on demand bike is designed to assist the rider. With this type of E-bike, you do not have to pedal, but if you do, you will increase the speed and range of your bike. Pedal assisted E-Bikes are a great option for people that want to get a little exercise but don't want to work up a significant sweat on their commute. Pedal assist also lets you go off-roading and can give you a little boost on difficult areas or when you get a bit too tired. Ideal for people with injuries like bad knees or hips or COPD. This can significantly help get people riding again that were not able to ride a bike due to physical limitations. This type of E-Bike allows you to pedal on your own without the assistance of the electric power motor. A twist of the throttle gives you a little boost when you need it to get up hills or go through rougher terrain. Pedal assist works with a torque sensor in the hub that senses your pedaling and adds energy when needed to get you going. If the battery dies out on your ride, you can still get home and pedal like you would a standard bike. Most models are designed to go about 20 miles per hour, and some models have a range of up to 60 to 70 miles on a single charge. Throttle on demand is just like a scooter or motorbike; pull the throttle and off you go without pedaling required. Some E-Bikes with throttle on demand do not have pedals and will not operate when the battery is dead. This means if your battery dies you do not have the option to peddle like you would with a pedal assist bike. The two types of E-bike have the same basic features, a motor, a battery, and a control system. Both require good maintenance practices to get the most out of your E-bike. A common complaint from people that commute to work on their bike is that they get sweaty on the way to work. An E-Bike can really help with that and make your ride to work a joy. Keeping your E-Bike in top shape is more important than on a regular bike. On a regular bike, if a few things are not quite right, you just have to pedal harder, but a poorly tuned E-bike can dramatically affect the battery life and power range. Not only that but most E-bike cost much more than your average bike, and you will want to maintain your investment to get the most out of it. The hub motor is located in one of three different locations, front, center or rear mounted. The motor in different position affects the weight distribution of the bike. The ride and feel of the motor will be different in each location. There are pros and cons for each area and many personal preferences from E-bike users. It is not something you can quickly change so here are a few brief points to consider before choosing an E-Bike. I will discuss the pros and cons of each location and which location suites your riding needs. I note on the following E-bikes listed were the hub is located. One of three different locations, front, center or rear mounted hub motor. 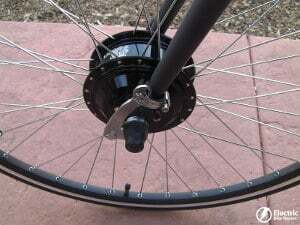 The rear hub motor is located on the back tire and is more common in lesser expensive bikes. Many say it is the best place for the motor. With the extra weight of the motor at the back better traction is obtained and the tires have more grip. Since the power is coming from behind you, the feel is more natural like you are being pushed forward. The back wheel also has more ground contact than the front wheel and gives you more pep going up hills and in rough terrain. A rear hub motor is the best for traction. You also can easily shift gears. The downside of a rear wheel hub motor is the weight distribution is not as good as a mid-drive bike. Some motors can weigh up to 15 lbs. This prevents you from putting too much weight on the back bike rack. 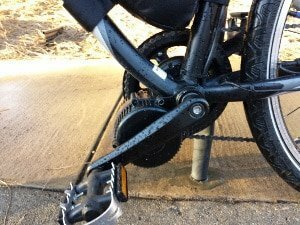 Also depending on the weight distribution and the size of the battery, it can make it hard to keep your front wheel on the ground and difficult to steer. The rear tire will be more difficult to remove and fix than a conventional tire and may require you to go to a shop to fix a rear tire flat. Fixing on the go may also be difficult. Using tire tubes or thicker tires and maintaining correct tire pressure will help prevent flats. Regular maintenance can help reduce breakdowns see my Electric Bike maintenance Guide to help you keep your bike in optimal condition. A back hub motor will not wear your drivetrain down as quickly as a mid-drive hub motor. But battery consumption on a rear hub motor will generally consume more power than a mid-drive hub motor and therefore usually have bigger batteries than a mid-drive motor. The mid-drive hub motor is located in the center of the bike in the area were your peddle mechanism is. It varies from system to system. Many have all the sensors located in the motor. It measures your speed, torque, and cadence. This information will work with the peddle assist and give you a boost as you need it. A mid drive hub motor seems to provide you with the most balance bike of the three locations. The center located motor hub gives the bike a low center of gravity and good balance. You can shift like a regular bike, and use peddle assist and add more power when you need it. Making it great for climbing hills. Without the motor at the rear, there is less weight, and this allows you to carry more weight in the back and put less stress on your back wheel. Mid-drive hub E-bikes are generally more efficient than a rear hub motor and therefore have smaller batteries. This means the overall weight of a mid-drive hub E-bike can be less than a rear drive motor. A mid drive hub motor is moving a lot less mass than the rear tire motor. It is only moving a sprocket and not a whole wheel. This allows it to be more efficient and will enable you to use a smaller battery. With its low center of gravity, a mid-drive hub motor is better at climbing hills than a rear hub motor and definitely better than a front hub motor. A mid drive hub is ideal for mountain biking. From a performance aspect, if you intend to peddle as much as you use the electric assist, a rear wheel and mid-drive hubs seem to work best. Although the mid-drive hub motor is great on hills, it doesn't maintain speed on flat surfaces as well as a rear hub motor and require you to do a little more work. A mid drive hub will wear your drivetrain a little faster because of the extra torque on your chain and sprockets, and you will have to replace them more often as opposed to a rear hub motor. Some more expensive E-bikes have shift sensing this backs the motor off while changing gears and reduces the stress on the chain and sprockets. The front hub motor is located on the front wheel. This naturally will make the front heavier. The battery is often found on the frame of the bike and acts as a counterbalance. The feel of a front hub motor is more like you are getting pulled as opposed to being pushed like a rear hub motor. Having the hub motor mounted on the front keeps the back of the bike the pretty much the same as a regular bike except now there is a battery on board. Front hub motors are common on scooters and trikes and E-bike cruisers. If you are a DIYer a front hub motor is one of the easiest and most inexpensive ways to convert a conventional bike into an E-bike. Kits can be purchased for $100 to $200. See Amazon's E-bike conversion kit. You will need some tools and intermediate skills level as converting a conventional bike can get a little complicated. It can be a great learning experience. The most significant disadvantage of a front hub bike is that they are not as powerful going up hills as rear or mid hub motors. Handling is very responsive on flat terrain but going up a hill on a wet surface could cause slipping if you don't pedal. This makes it a poor choice if you plan to do a lot of mountain biking and to go on trails. Changing your front tire is now a little more complicated. A front wheel hub is not as efficient as a mid-drive hub. This means less battery range or a bigger heavier battery. Check regulations in your area before purchasing an E-bike or adding a motor to your bike, if you want to ride it on the streets. 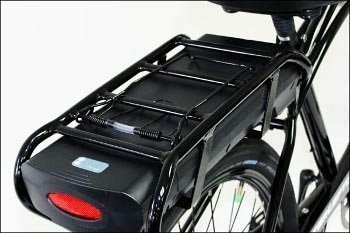 The battery is a very important component to the E-bike. The battery is what provides the power for the motor. Battery technology over the last 10 years has been much improved providing faster charge time and longer range. Most batteries on newer E-bike are all now using Lit-hum ion batteries. They are lighter in weight than older style lead batteries and often have a better charge capacity. Batteries come in a variety of power configurations, like 24 volt, 36 volt and 48 volt batteries. A E-bike battery normally weighs in at around 7 to 10 lbs and where the battery is located greatly effect the handling and feel of a bike. Below are the two most popular locations. Rack mounted batteries are very common especially with DIYers and conversion kits. It is the easiest and largest location to put a battery with minimal modifications required. The high mounted weight of the battery can affect handling when cornering. The added weight to the rear also makes the front tire have less traction. Not the best location for weight distribution. The most common location and arguably the best position is on the crossbar or the down tube. 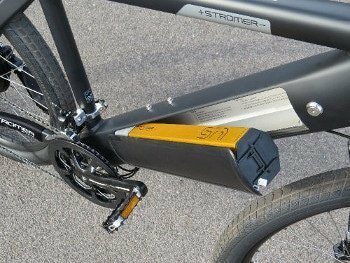 Many new E-bike companies start by mounting the battery in this area and eventually evolve into custom frames and better sleeker in-frame fitting. This puts the significant battery weight low on the bike which improves handling and makes wiring more accessible. This also makes it easy for E-bike manufacturers to run the wiring in the frame tubing providing excellent protection and a nice neat look. To learn more about battery care see my post How to care and maintain your E-bike battery. There you have it, think of what you will be doing mostly with your E-bike and decide from there what type of E-bike is best for you. A good fitting bike is more important than the cost. Also as I always say if you don't plan to use your E-bike regularly buy yourself a regular bike. You will be spending hundreds of dollars for battery replacements and in turn making and E-bike an expensive ride. If you can go somewhere and test a few out to see what is best for you is also a great idea. Also be mindful of your local regulations if you want to ride on the streets, some areas are stricter than others. I hope this list helped you and if you have a great E-bike, you would like to tell me about please share.